Today, in Denver, Colorado, a large crowd will gather as many tune in from around the world to celebrate the life and legacy Father Thomas Keating. 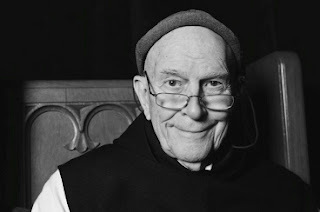 Father Keating, a Trappist monk, died at the age of 95 on October 25th after a prolonged period of ill health. He is not known particularly widely in the secular world, but to those of us who try to live in a more contemplative way, he was a guru. Thomas Keating is renowned as a pioneer in contemplative living and a world figure in interfaith dialogue. He wrote many books and spoke to many audiences throughout his life, gaining respect as a world wide teacher. He was one of the key people involved in developing the concept of centring prayer, silent prayer centred entirely on the presence of God. In a video I have watched, Keating describes centring prayer as all about heartfulness, which is a little different to mindfulness. Some may feel this type of prayer is sitting in a void, but Keating describes it as sitting in the presence of God who is already there. 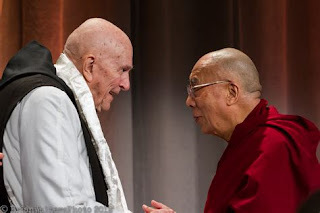 It is not surprising to me that Thomas Keating was also a lead figure in interfaith dialogue. In my experience, when we strip back the words that we have padded around our relationship with the divine to discover the centre, the essence, the core, we often find ourselves in a place of mystery and silence that opens doors and windows to speaking a different language with those who are different and other. My favourite quote of Thomas Keating's is, "Silence is God's first language. Everything else is poor translation." Silence may be peaceful, but it is also extremely powerful. Thank you Thomas Keating!